San Francisco is the kind of quirky place where a fog-calling contest might compete for attention with gala balls marking the opening of the symphony, opera and ballet seasons. From Union Square to North Beach to Japantown, you’ll find intriguing neighborhoods at every turn. The writers of the Beat Generation, the hippies of the Summer of Love in the late 1960s and the gay and lesbian population contributed in making the city what it is today. San Francisco is also one of the world’s great dining destinations, thanks in part to the diverse cultural influences and proximity of fresh ingredients. It’s a city of contrasts – old and new, cutting-edge and laid-back, urban and pastoral. This is a city in constant evolution. Add iconic sights like the Golden Gate Bridge, Fisherman’s Wharf, Alcatraz Island and intriguing neighborhoods as individualistic as they are dynamic, and San Francisco becomes captivating, creative and truly unique. Music is an integral part of the American experience. 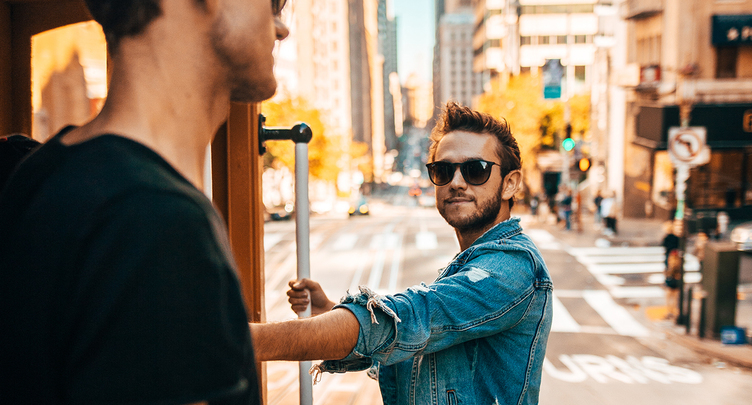 This fall, we partnered with Zedd during his Echo Tour in San Francisco to learn why he loves visiting and performing in the City by the Bay. Click here to watch. San Francisco is a place of landmarks and photo opportunities, not the least of which is the Golden Gate Bridge. Crossing the famous suspension bridge that spans San Francisco Bay via bicycle, by car or on foot is a must. The best way to see it all is by climbing aboard one of the cable cars serving California Street, Chinatown, Nob and Russian hills, and Ghirardelli Square near Fisherman’s Wharf. You’ll find public art throughout San Francisco. In the Mission District, visit Balmy Alley with its colorful murals depicting city history. At the intersection of Broadway and Columbus Avenue in North Beach, “The Language of Birds,” 23 “flying” books with words and phrases that “fell” to the street, tells of the area’s literary history. The ethereal “Soma” along the waterfront is a cluster of LED “neurons” flowing through nine-meter “dendrites.” The Bay Bridge, connecting San Francisco with Oakland and the East Bay, has the “Bay Lights,” offering an enchanting view from the Embarcadero, or the eastern portion of the waterfront. You’ll also find rotating art installations around the city in places like Patricia’s Green in Hayes Valley. You can spend your entire visit in the Embarcadero and not see it all. Get to know local marine life at Pier 39, home to both lounging sea lions and the Aquarium of the Bay. You can also catch a tour to Alcatraz Island here. A recent addition to the waterfront is the child-friendly Exploratorium at Pier 15, an interactive museum delving into science, art and human perception. Take a break for a bite to eat at the Ferry Building Marketplace, which hosts restaurants and vendors selling artisanal cheeses, wines, fresh produce, breads and seafood, before taking a ferry across the bay for a different view of the city. San Francisco is the gateway to Northern California’s wine country, and much like the region’s varietals, its neighborhoods are known for their distinct dining flair. You’ll find no-frills Mexican in the Mission and Castro districts alongside up-and-coming sushi and Chinese restaurants. Dim sum is everywhere in Chinatown, and North Beach is famous for its Italian food. In the shopping paradise of Union Square, find Michelin-starred and celebrity chef restaurants alongside old-school establishments and casual eateries. After dining, wander over to the city’s 411.6-hectare urban oasis, Golden Gate Park, and enjoy the tranquility. Stroll through the San Francisco Botanical Garden, ride the carousel, or visit the bison herd, the conservatory and the windmill. The park also houses the de Young Museum featuring contemporary art and the California Academy of Sciences and its aquarium, planetarium, natural history museum and living rooftop. Both are must-visit spots before stopping to reflect on your San Francisco experiences in the Japanese Tea Garden. The fortune cookie was invented in San Francisco.